Is it a Drama? A Comedy? Or Music Hall dream? 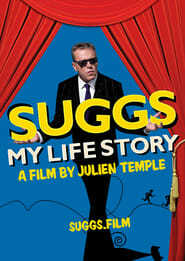 Director Julien Temple (The Great Rock n Roll Swindle, Absolute Beginners) takes a stage show, adds some drama, archive, animation and music, then shakes it all up for MY LIFE STORY where singer Suggs, takes a hilarious, yet moving, look back at his life in music and words. The death of Suggs' beloved cat on his 50th birthday triggers a personal quest to discover what happened to the father he never knew. Stunned by what he learns Suggs is taken back through his life to a childhood on the streets of Soho featuring music written by The Kinks, Ian Drury and, of course, his beloved Madness.